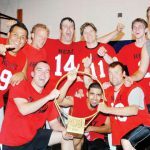 For the first time in more than two decades, the RCBL, the Island's adult basketball league, failed to materialize over the winter. 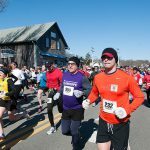 A cool, bright day, perfect for distance running, saw Paul Ryan of Boston take the early lead and keep it to the finish. The 8th grade girls travel basketball team tackled a tough Harwich squad at Harwich, Saturday, and came away with an impressive 43-38 win. The unbeaten Edgartown girls stayed perfect in junior high hoops with a win over Oak Bluffs. The OB boys beat Edgartown to return the favor. 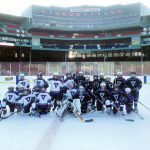 Tuesday, Jan. 3, twenty-five Islanders, all members of MV Youth Hockey Squirt teams, played in front of the Green Monster at historic Fenway Park. 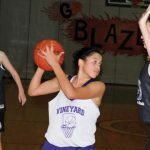 Somerset Berkley swept the Vineyard girls basketball teams in high school hoops action Tuesday at MVRHS. 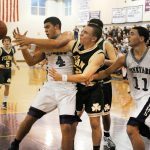 Bishop Feehan jumped on top early and survived a late Vineyard surge to hand MV its first loss of the season in boys high school hoops. 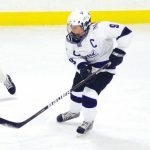 The Vineyard girls varsity hockey team heads into the Nan Rheault tourney riding the momentum of a 6-0 win over division rivals Cohasset/Hanover. 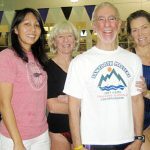 Four members of the M.
Saturday's lackluster performance followed on the heels of the Vineyarders' 10-2 thrashing of the Nantucket Whalers Friday night. The boys JV game was a seesaw affair with a multitude of fouls, but at the end the day, the game belonged to the Islanders. Vineyard alumni played in hockey and basketball games held last Friday at the MV Arena and the Sancy Pachico gym. 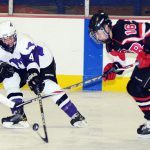 The West Tisbury girls almost let one get away against the Oak Bluffs Blazers on Dec.
Samantha Potter of Oak Bluffs and her partner, Natalia Pezzuco of Providence, R.
Season opener victories for both boys and girls hockey teams. The 8th grade girls travel basketball team continued their winning ways by defeating Nauset, Saturday morning, at the Sancy Pachico Gym, 42-17. High school winter sports begin for real this week.